Legions, Rare. 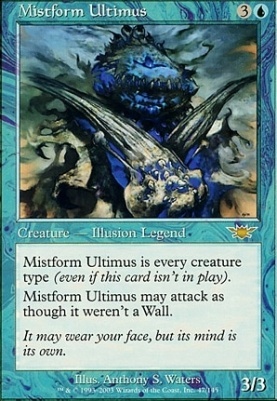 Notable as the first creature printed to have all creature types, Mistform Ultimus was the focus of much Magic related humor for a number of years. I liked to call it Ditto, after the Pokemon that can seemingly breed with anything—but that’s enough crossing the fandoms. Think about it, it’s a Minor Mutant Ninja Turtle (Sadly, Teenager is not a creature type… yet). It’s a Zombie Goat Dragon God! It’s a Fairy Ooze Mercenary! The list just goes on. Sadly, the Ultimus’ time in the innovative spotlight was short-lived. In 2007, Lorwyn released and with it came the Changelings, a tribe of shapeshifter cards that had the changeling ability which read “This card is every creature type at all times”. Suddenly, our friend the Ultimus was no longer the cool, novel card it once was. Instead, it was made obsolete by Changeling creatures that were either more efficient like Chameleon Colossus or, like Mirror Entity, simply outclassed it with their abilities. The only thing Mistform Ultimus has over all the other Changeling cards is the fact that it is Legendary. I’d love to see a deck really take advantage of the original Ditto.